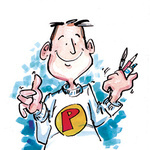 I will produce a minimum of 10 full colour illustrations supplied as high resolution jpegs ready for print. Initial sketches for prior approval from the author before starting any finished illustration. I offer a service of book design ready for self publishing. I work in detail with the client at every stage so there is no misunderstanding with imagery, time scale and budget. I require clear instructions as to style of illustration, the important aspects of the book which are to be illustrated and wether they require finished digital artwork or individual illustrations. The price is based upon supplying a minimum of 10 Full Colour Illustrations. Outstanding work! Loved working with Paul. Another blinding job by Paul. Cheers pal. Look forward to the next job. Paul was very helpful and patient with my project, and I am delighted with the end result. Recommend to all. Thanks again Paul, hope to work together again in the future. It was great working Jon on such a personal project for his three young boys. Fantastic person to produce illustration for. What can I say, working with such a talented person as Paul is simply a complete luxury. Besides his creativity and skills, Paul has shown during the process an excellent attitude and communication, always willing to help and satisfy any need. With no doubt, the best partner you may find. More than recommended! Paul did a great job. We encountered some unexpected issues and he worked with me until they were resolved. Thank you! Thanks Paul. Fast work and very helpful. With over 30 years experience working both in advertising and in a freelance capacity I have a wealth of experience to put forward. I am primarily an illustrator with a quirky sense...Read moreWith over 30 years experience working both in advertising and in a freelance capacity I have a wealth of experience to put forward. I am primarily an illustrator with a quirky sense of humour, but my skills extend to logos, books, e-books and illustration for websites. I adopt a professional approach to all work, and I always endeavour to please and satisfy the client's needs should it be in the realms of PPH or day to day freelance.